And, as per most tape explorations I've conducted, a high number of these tapes contained films, in particular many, many Bond films and about three recordings of Robocop 2. However, here and there, I unearthed a few little gems of television. The most common place to find these snippets and clips tended to be towards the end of tapes, after the main films when sections of previously recorded shows would emerge from the static of Bond credits. Here's a few of the bits and pieces I've found - with contributions from some other VHS tapes which have come my way - in the last month. 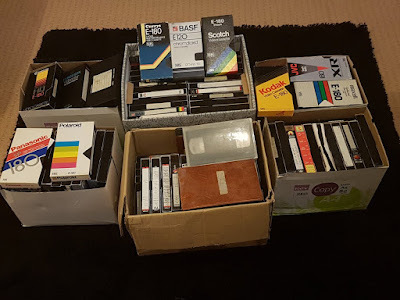 Despite believing that all but one of my original VHS tapes had been part of the great VHS purge my home experienced in the mid 2000s, I was delighted to hear from my mother that she had found a few tapes in my bedroom. One of them contained mostly wall to wall Disney cartoons and the original transmission of the Doctor Who serial 'Survival' (which almost brought a tear to my eye as I remembered by Dad's dedication to recording the last two seasons of Who for me), but also, at the end of the tape, was around 5 minutes of this rather strange Gloria Hunniford health/quiz show 'Go For It' which ran for 10 episodes in 1989 and was never repeated. The very first tape I picked out - a wonderfully retro shell-like case Memorex - from my latest collection of VHS tapes just happened to feature two Nationwide features from January 1983 which featured Anne Diamond and David Jensen looking ahead to the upcoming British Rock and Pop Awards (which would later morph into industry gig The Brit Awards). And doesn't Anne Diamond look young here? And as for David Jensen's early 80s jumpers, they're things of true beauty. Another early highlight of the tapes was this five minute segment from Saturday Superstore featuring Mike Read discussing the wonders of blue screen effects with Matt Irvine from the BBC Visual Effects department. Having been brought up on Going Live! and then Live and Kicking, I've always been a fan of Saturday morning BBC children's shows, so it was really fascinating to watch something that was likely playing out in the background as the four month old me cried for a bottle. Admittedly it's just a snippet of one of the biggest stars of TV in the mid 80s, but it's also a very rare piece of continuity from Roland Rat which featured in his Rat on the Road show which followed Good Morning Britain in the summer holidays. And just look at that amazingly retro mobile phone which taps into Roland's sophisticated rodent about town persona. Oh, and it was filmed in the Hilton, Park Lane - a fact I know because Roland Rat told me on Twitter. Nestling at the end of one tape was a complete episode of Coronation Street from 1984 which not only featured Percy Sugden wearing a delightfully 80s blue parka, but also a ridiculously young looking Kevin Webster and Gail Tilsley. However, even more intriguing was that there was a HTV In-vision section which featured Margaret Pritchard narrating a trailer for that evening's Minder and also introducing the latest episode of Coronation Street. Now, most ITV regional In-vision sections were never kept, so it appears this is a piece of missing television, albeit tiny. Nonetheless, I'm as pleased as punch to find something unusual and will be fowarding it over to the good chaps at Kaleidoscope who do search a sterling job in archiving and preserving such bits of footage. Allsorts was one of my favourite children's shows as I was growing up and, truth be told, I carried on watching it long after I had departed the target age range. And that's why I was thrilled to find this on a tape that was sent my way this month, especially when the amount of existing footage on YouTube is fairly sparse. This particular episode sees the gang sorting through some jumble and, whilst this may sound sedate, it's shot through with that amiable brand of presenting, adventure and activity that the series made its trademark. I had absolutely no idea that Sky Sports had shown any form of top level football prior to the Premier League, but it turns out they had been transmitting FA Cup games since 1991. And here's the half time chat from the Chelsea v Sunderland game which features Vinnie Jones, Ron Atkinson and Richard Keys discussing the main talking points from the first half. And Vinnie Jones rolls up his trouser leg to show off his FA Cup winners tattoo whilst Richard Keys wears a hideous Sky blazer. 8. Reflections - ?! - ?! Now this is a real oddity of a find which has proved almost impossible to identify, so it's a curious beast indeed. It appears to be a gardening programme featuring a Welsh chap called Richard Bowering taking a jaunt round his mate's garden and admiring all the foliage, but that's all I know as the end of it is missing, so I can't identify a channel or year of production. However, given that many of the tapes I've received this month have HTV or BBC Wales idents throughout them, and this show features the heavy presence of Welsh accents (and miners), makes me think this is some type of regional programme. If anyone's got any ideas then please get in touch as I'd love to identify it! A massive thanks, of course, goes out to the people who have donated tapes to me this month. And, as ever, I'm still on the lookout for plenty more of your old VHS tapes (particularly ones from the 1980s), so send me an email if you can help! Allsorts! I've never been able to watch Emmerdale properly because I always thought Cain Dingle looked like the bloke off Allsorts! He went on to do Radio Roo on CBBC didn't he? With the over-the-kiddies-heads naming of Derek and Clive (at least, I hope it was an intentional homage to Cook and Moore) Keep up the good work Ben, this stuff is fascinating! And, yes, he went on to Radio Roo. I used to watch it, but can't remember too much apart from the kangaroo puppet and that it was a pretty bizarre setup! I've gone through all the tapes now! Need to find some more! Thanks for the links! Looks like Reflections was a regional show for BBC Wales. Wow, that Allsorts intro activated something way, way at the back of my brain. It's like it was anticipating each part of the intro animation before it arrived, and the kite titles at the end topped it off. I thought I remembered all the kids TV I watched in my youth, but there's always something waiting to surprise me! I used to love nipping home from primary school for lunch and catching an episode of Allsorts!